You can't keep Dave Tipper down. After our good friend survived open-heart surgery in 2013, he bounced back to deliver epic sets in the desert at Burningman, thumbing his nose at the gods with his unflinching courage. 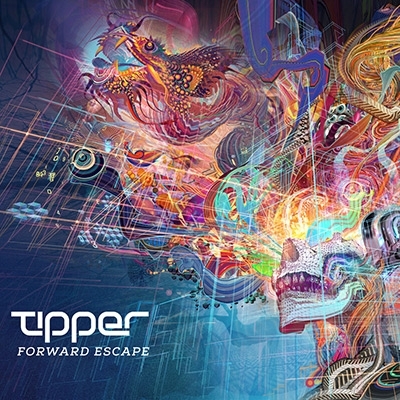 Tipper has now triumphantly returned with "Forward Escape", approximately his tenth full-length and undeniably one of his strongest albums to date. Having been one of the keystone producers in the nu-breaks and glitch-hop movements, a pioneer of style and surround sound, "Forward Escape" sees Tipper returning to the lush, downtempo sound that made his last full-length "Broken Soul Jamboree" such a trip. Beats don't drop here, so much as they unfurl like mystic winds caressing a fractal forest, rousing familiars and invoking the spirit of the great protector. His micro-edits of unparalleled precision transpose every nanosecond into its own universe, where the most fantastic raver fantasies are not only possible, but probable. This album doesn't sound like an album; it feels like a living entity, a plane of existence, a blissful state of being that so many aspire to yet so few achieve. The mind is overwhelmed with possibilities, attempting to keep up with the depth and character of "Forward Escape". The jazz bass underpinning the percolating "Homage Sliders" brings to mind Squarepusher on DMT. "Apex of the Vortex" has a summery vibe, care of a delayed guitar and snappy drum programming, while the lush strings, organic drums, and tightly wound sample manipulations of "Rip Cord" lend it a worldly yet contemplative feel. The whomp-laden bass and skittering percussion of "Gulch", the finger snapping of "Grabbers Holders", the liquid ambiance of "Life Raft For A Death Trip"... all such things wash over the listener, changing them in ways sublime yet not fully understood, pieces of a puzzle too grand for comprehension. Suffice to say, Tipper has proven his unparalleled technical prowess yet again with "Forward Escape". It's an album to slay all chill stages, yet is deserving of its own ritual. Light a candle, turn down the lights, put this album on, and watch time slip into the future.